Helps integrate immigrants into the community by providing education, advocacy and referrals to social services. Provides free high-quality, previously owned, professional clothing to women entering the workforce. Provides new clothing for eligible Benton county children K-12 whose school attendance and performance are threatened by lack of suitable clothing. Offers a full array of programs delivered by trained behavioral health professionals. Services focus on recovery, independence and skill building for people with mental health and substance use issues. Provides support for children and adults with intellectual and developmental disabilities. Offering quality programs and after-school care to youth grades K–12. Services and support to those affected by sexual and domestic violence. Federally and state mandated non-profit organization that recruits, trains, and supports community members to advocate for the best interest of abused and neglected children. Provides basic needs to the homeless and poor. Helping to stabilize those in crisis, feed the hungry, house the homeless, heal the sick, and counsel the mentally ill and substance addicted. Offers services in Linn, Benton, and Lincoln counties that focus on essential day-to-day survival, such as food and housing as well as developing new skills that lead to independence through education, training, and work. A main library, three branches and a bookmobile provide a wide variety of services for Benton County residents. Provides loving and experienced mentors and tutors to children with special needs in Linn and Benton counties. Redistributes quality used furniture at no cost to children, families and individuals in need. I’m Healthy! / ¡Soy Sano! 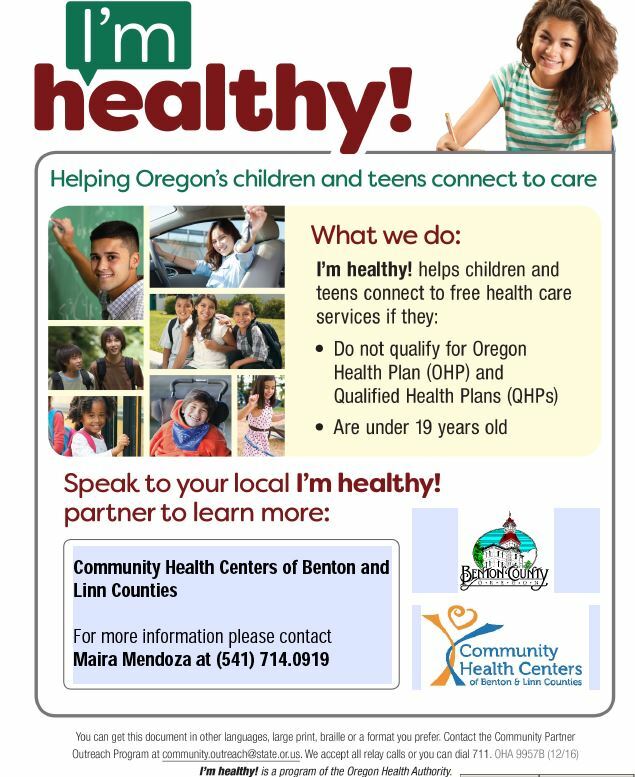 Helps children and teens connect to free health care services if they are under 19 and do not qualify for the Oregon Health Plan (OHP) and Qualified Health Plans (QHPs). Provides shelter services, mentoring, education services, and independent living skills workshops. A free infant/toddler and preschool program that serves families from Linn, Benton and Marion Counties. Special education services for children birth to kindergarten that exhibit a significant developmental delay. Provides a full range of evaluation and treatment to county residents of all ages. A partnership of local churches that mobilize volunteers to help those in need, by filling gaps in services and resources in the community that are not currently being met. Compassionate care for seriously ill persons and their families. Nature-based childcare center at Community Outreach Inc. Supports and nurtures children who come from families with a history of domestic violence, drug and alcohol abuse, and/or homelessness. Oregon’s 25 Relief Nurseries provide vital services to vulnerable families with children under the age of 6. DHS works hard to help children be healthy and safe. For families of children with social, behavioral, or emotional issues, autism and developmental disabilities. Provides positive recreational and educational opportunities to youth in the community. Working to build stronger families and communities in rural Benton County through education, advocacy, coalition building and community connections. Provides clothing and household items to low income families of Benton County.